Dragonfly Designs: This has got to go! It's just not working for me. 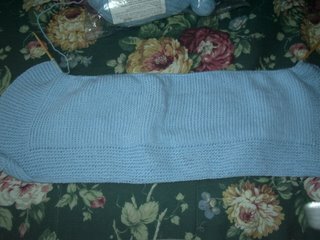 I'm going to frog it, and I think I'll make the woman at work another sweater for her son. I still have to get buttons for the Pea Pod sweater, and do the hat and booties. I think another cardigan is in order. The first one turned out nicely, so #2 will be on its way. I knit NOTHING this weekend. I just didn't feel like it, since we went to visit with my parents and grandmother, since my grandfather's in the hospital. I know that at least he knew and was excited about having a great grand-son. I am sorry he won't be able to see him. The stroke was extremely damaging, and it seems that the damage is irreparable. The doctors don't give him much chance of even being able to swallow on his own ever again, and even if he does, it seems he's blind and won't regain his speech capacity either. It's sad, but we knew it was coming. I'm working on some patterns, and I might post one on here for free, and I think I might submit the other to Knitty. We'll have to see how it comes together, particularly while the baby's on the way. One of them is for Knit the Classics, and the other is in memory of my grandfather. I don't know why, but he seems to inspire something that needs to be created. If I can't get the pattern accepted somewhere, I'll post it here as well. I am thinking about the rest of my grandparents, and potentially creating patterns in memory of them as well. I will have one grandmother left (my mom's mother) after my grandfather passes, so I find the patterns will all be "in memory of" rather than "for" them.